Tuesday, August 28, 2018 - President Uhuru has become the third African Head of State to hold talks with US President, Donald Trump, at the White House after Nigeria’s Buhari and Egypt’s Fattah al-Sisi. 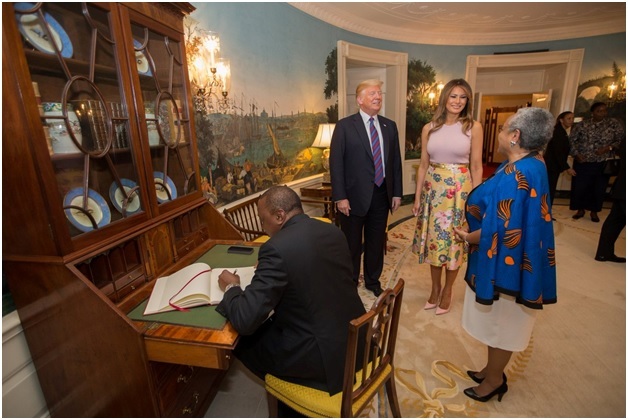 Uhuru and First Lady Margaret Kenyatta were received by Trump and First Lady Melania Trump at the South Portico, before briefly posing for pictures. The four proceeded for a bilateral meeting in the Oval Office before addressing the media with short statements. Uhuru and Trump then joined their aides in the Cabinet room for expanded talks. Check out the photos in the next page from the meeting.